Come Dive with us on the Beautiful Alabama Gulf Coast! About a half hour from Pensacola, Florida is Perdido Key and the Alabama state line. Go another three miles and you come to the beautiful Perdido Pass, what the locals call Alabama Point. This is where the diving starts in these parts. From here a diver can go out in the Gulf of Mexico, down the beach for a beach dive, or just dive the Seawall or Jetties. 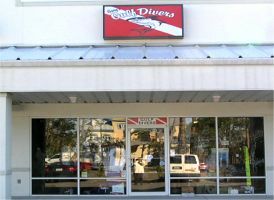 Dive Pro Gary has been diving the area for many years and knows all of the best local spots. Scuba lessons are offered for all levels, from beginner to dive master and many specialty courses, with PADI Certification. Dive charters are available on three custom dive boats to accommodate all levels. The shop features top of the line Dive Gear and a large selection of dive accessories.